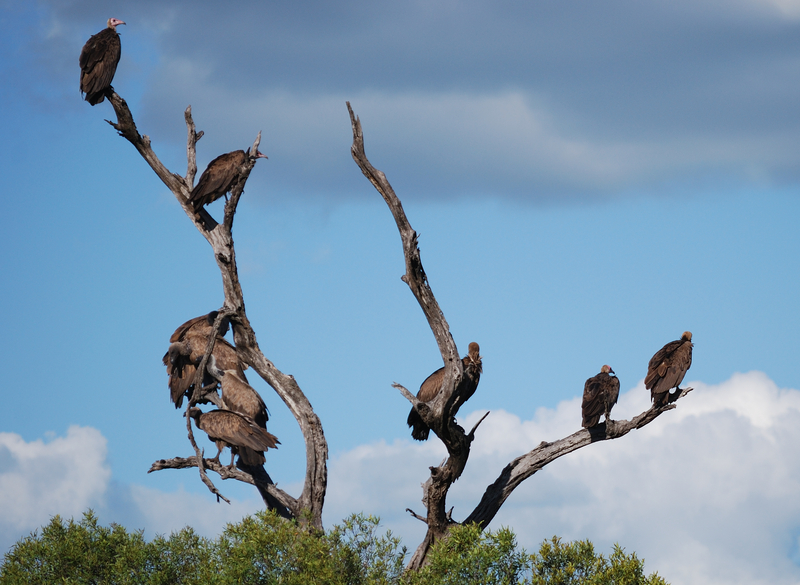 As we approached, we could tell that this must the place: the trees were full of buzzards patiently waiting, and a number of vehicles were parked together on the edge of the dirt road, somewhat off the main drag. We parked among them and looked over toward the trees, hoping to see the lion kill that our safari guide had been told about. 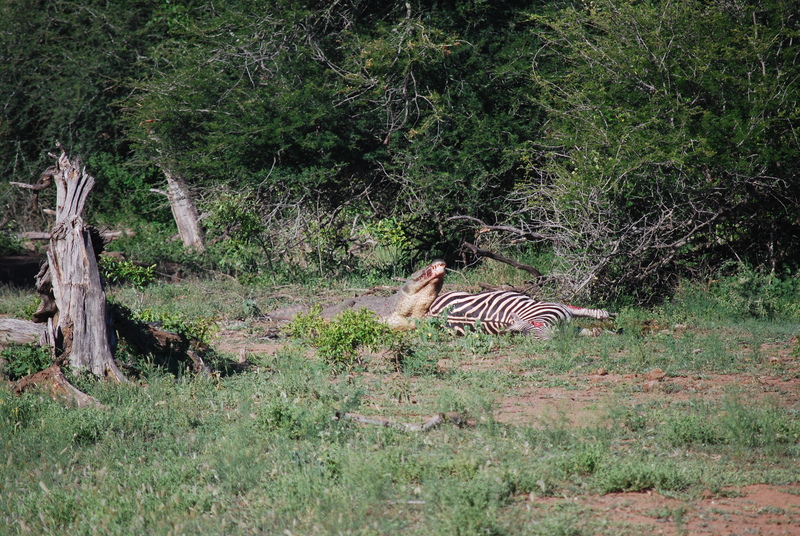 Approximately 50 yards away, a zebra was laying on its side. Its head moved. “It’s still alive!”, I cried. No, the carcass was reacting to being yanked from behind by the huge crocodile, who evidently wanted to drag it to a more secluded spot where he could be more comfortable with his stolen booty. 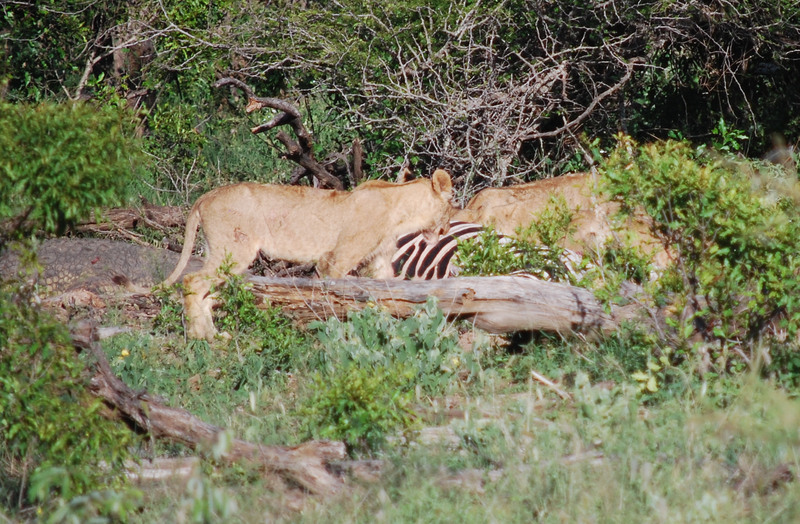 However, the zebra was too heavy. 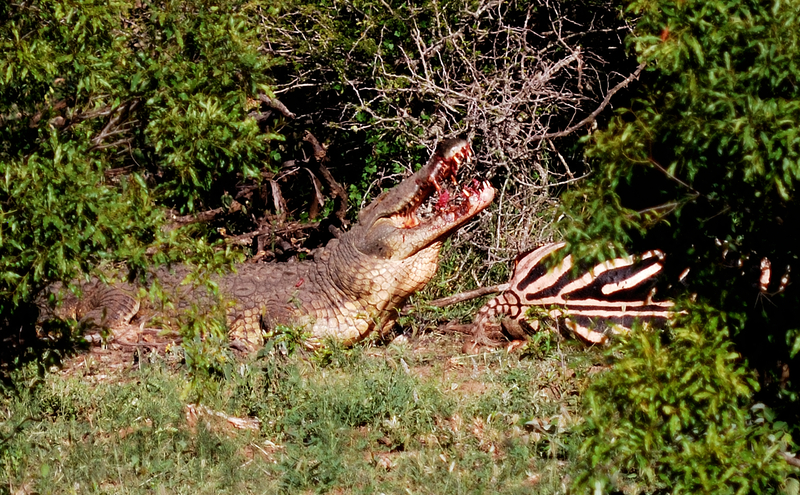 Soon, the crocodile gave up on the idea of moving the carcass and started to eat from the hind quarters near the tail. Someone saw a lion in the bushes, but she had evidently been chased off her kill by the huge marauding reptile. Once the croc had eaten a bit and seemed calmer, the mother lion decided it was safe enough to come out of hiding. She emerged from the bushes and walked around, keeping her distance. One of her half grown cubs followed her example. Finally, the mother came up to the carcass on the side opposite the croc. She opened up the belly of the zebra. She offered the guts to the braver of her two cubs. 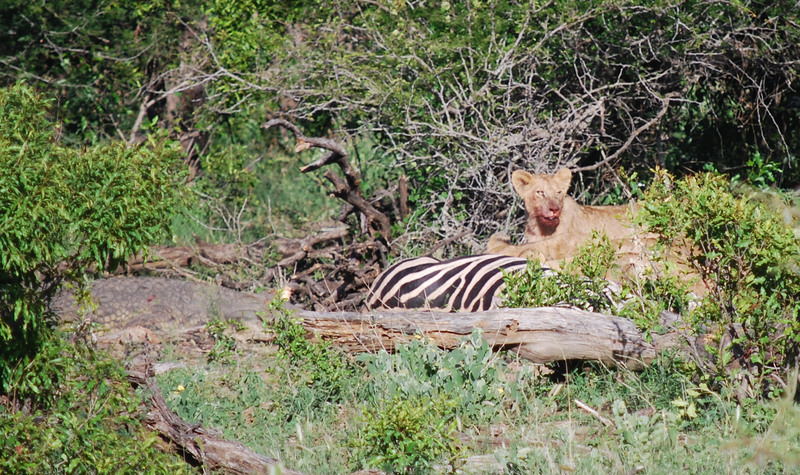 After a while, the second cub appeared, and got a turn at the innards of the the zebra. A group of baboons happened by. Seeing the lions, a male called out a warning. Some went up a tree a safe distance away to look at the scene for a while. They soon moved on. A pair of tiny antelope, perhaps springboks, came by. I thought they were foolishly brave, as they hung around for several minutes, not far from the huge predators. However, they were quite safe: the lions, with the gigantic feast of zebra in front of them, were not really interested in chasing after a little snack. 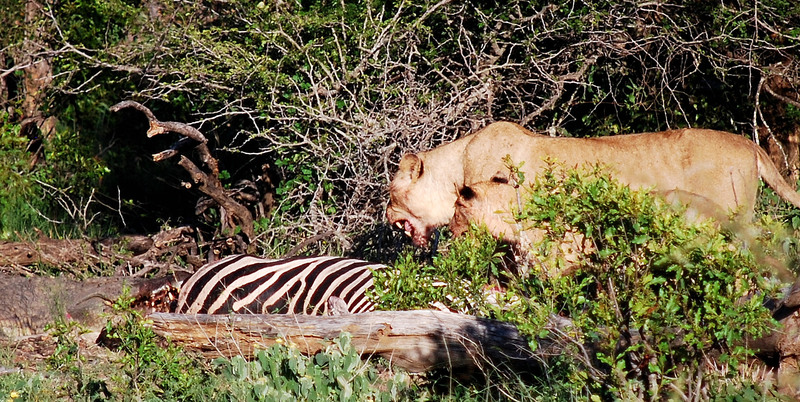 Eventually, the lions had eaten enough for now. They left the kill and went down to the water’s edge, to refresh themselves, and to clean off their muzzles. Many thanks to Mike Potticary, who provided all of the photographs used here. This is a wrapping for the series of posts on the celebration of the wedding of Santeri and Tsholofelo, which occurred in Itsoseng South Africa, following Tswana customs. I am aware that not everyone will want to wade through 11 chapters, however fascinating I think they are. So I am providing a table of contents, with commentary so you can sample as you see fit. The posts are roughly chronological, but do not need to be read in any particular order. 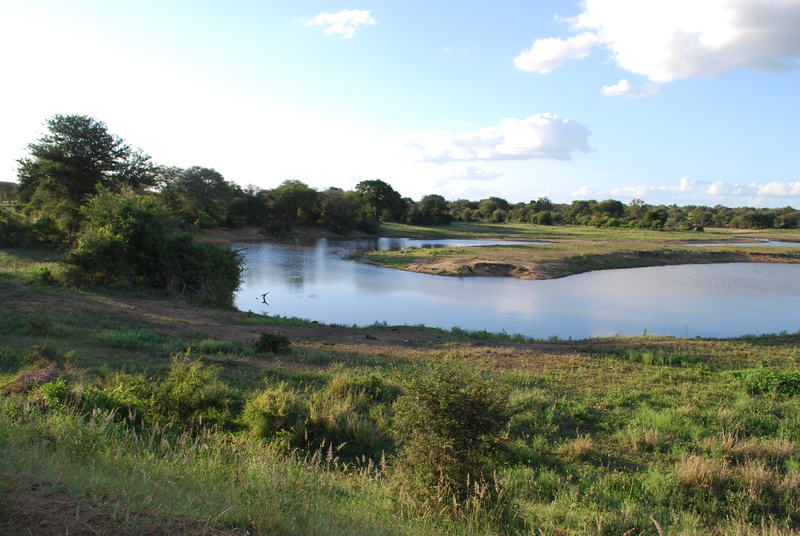 If you want to read just a couple, I suggest the Magadi and the Community. The best pictures are of the Feast. Lots of pictures. Not for vegetarians. A Tswana tradition, pictures with a little text. The Christian wedding. Lots of pictures. The main event. Lots of pictures, some video. Kerileng’s birthday celebration, and Final thoughts. I wish to thank Mike Potticary, for all of the work he did in arranging our trip, and for many of the photographs that I used in this blog. In addition, my wife Footie (her web site) provided photographs, videos, and several details that I would not have been able to describe accurately without her help. Footie and I both wish to thank Sioto and Kerileng Molale for hosting the entire celebration, and Metsiatsile Dinanas Mutloane for inviting us into her home. 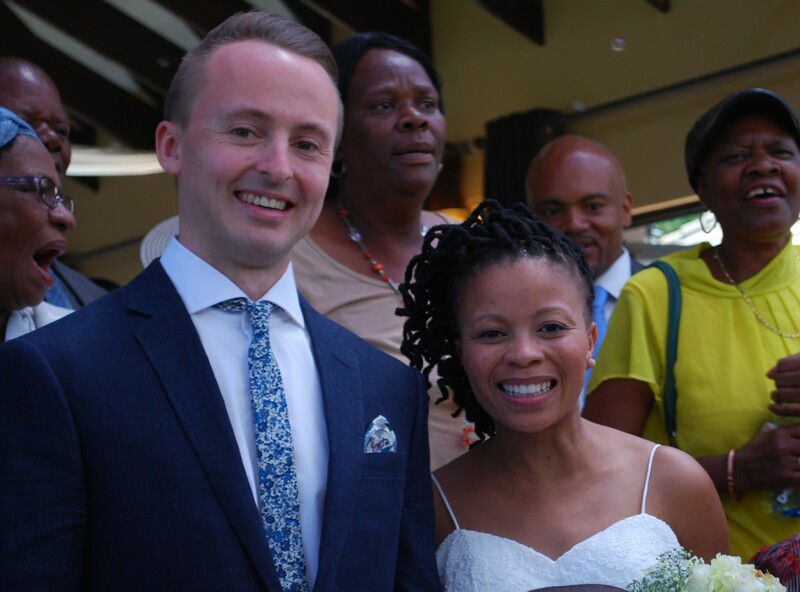 Finally, we offer our profound gratitude to Santeri and Tsholofelo, for deciding that such an event would be important, and giving us the opportunity to participate.